Numerous failed peace deals and ceasefire violations over the past few years mean faith in the country’s peace process is at an all-time low, which was reflected in comments from the White House over the weekend, questioning the commitment of South Sudan’s leaders. The latest peace agreement between the country’s political rivals comes after lengthy negotiations, heavy input from regional moderators and increasing pressure from the international community. While South Sudan’s leaders have shown little dedication in implementing previous peace agreements, the terms set out in Wednesday’s power-sharing deal place a stronger responsibility on both sides to ensure peace becomes a reality. Here’s a look at what we know about South Sudan’s latest power-sharing deal. South Sudan’s new power-sharing deal stipulates that there will be 35 ministers in the transitional government, comprising of 20 from President Salvia Kiir’s side, nine from rebel leader Riek Machar’s and the rest from other opposition groups. Machar will also be reinstated as vice president and Salva Kiir’s extended mandate will be respected. Machar will be joined by another four vice presidents under a transitional government that will remain in power for three years. The country’s parliament will comprise of 550 legislators, including 332 from Kiir’s group and 128 from Machar’s faction. An independent commission will also be formed to decide on the number of provinces in the country although details over power-sharing at regional and county levels are still to be negotiated. Wednesday’s power-sharing deal was a preliminary agreement and a final peace deal is due to be signed on August 5. A permanent ceasefire has already been agreed and both sides have agreed to withdraw troops from civilian areas. Will South Sudan finally get peace? The failure of previous agreements looms over the country peace process and concern over its leaders’ ability to implement this latest deal is justified. A similar power-sharing deal fell apart in July 2016 when fighting erupted between government troops and rebel forces in the capital of Juba, prompting Riek Machar to flee the country. The primary concern is that conflict will break out once again and the working relationship between Salva Kiir and Riek Machar is under question more than ever. Previous peace deals have broken down almost instantaneously with both sides accusing each other of violating the terms of agreement. However, the specific terms of South Sudan’s latest deal won’t be so easy for its leaders to flaunt and simply shrug off accountability. The world is watching and both parties are going to be accountable for any failures in implementing this power-sharing agreement. The consequences for violations this time around could be severe but the will of South Sudan’s leaders isn’t the only problem. While both parties have been accused of not showing enough dedication in implementing peace deals, it’s still not clear how much ability they have to ensure their forces and other armed groups in the country adhere to any ceasefire. 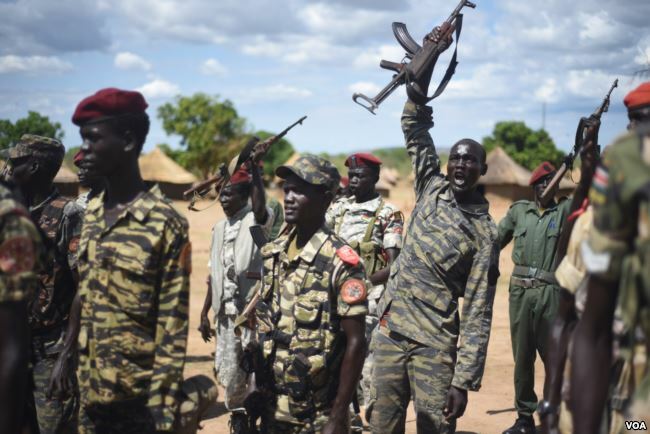 On June 27, a “permanent” ceasefire was agreed between the government and Machar’s rebel group but it was violated hours after being implemented with both sides accusing the other of initiating the violence.